Here's some quick and easy ways to get doTerra therapeutic essential oils into your children during the school day - super important during this crazy flu season! 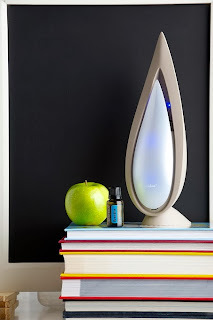 Click to read the doTerra Living article "Essential Oils in the Classroom." 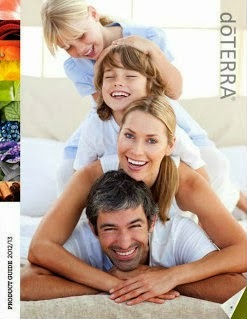 Photo by doTerra International. I put one drop of On Guard Protective Blend on my children's feet every morning before school, and again every afternoon when they come home. The typical child's immune boosting routine is a drop in the morning, then again at bedtime. But since school is where they pick up most of their bugs and last year we paid well over a grand in strep and "it's just a virus" co-pays, I want to nip potential illnesses in the bud. So it's morning, after school, and sometimes an extra drop at bedtime. Wild Orange tastes amazing! And it is a great EO to use at first signs of cold or flu (that's why it's in our On Guard Protective Blend). Add 1-2 drops Wild Orange essential oil to cut up strawberries. This delicious EO gives mandarin oranges a whole new flavor dimension - my 6 year old calls them ultimate oranges. Wild Orange is also a natural energy booster and improves focus. Put one drop in your child's water bottle, make sure they shake often, and help them to keep their school day productive. It is recommended that glass or metal water bottles be used for citrus essential oils as the oil can break down plastic over time and possibly cause chemicals to leach out into the water. A penny. Go Abraham Lincoln! My son gets a daily boost of lemon, lavender, and peppermint eo (the "doTerra allergy shooter") in his school water bottle because his allergy induced asthma is so bad. I had to ease him into it, and used his feedback to determine how much to give him. 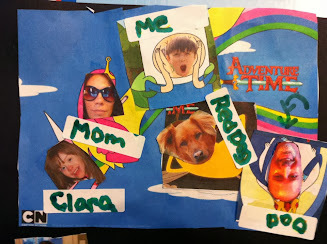 It took a couple weeks for us to find what worked for his palate and his allergy symptoms. Tip: Dropper cap assemblies make measuring eo's more accurate. We started off with one drop of lemon essential oil in his water bottle. He loved the lemon! But it is a natural diuretic, and he didn't like peeing more at school. Next came one drop of peppermint oil - much too strong, he said. Since one drop of a high quality peppermint eo is the equivalent of 26-28 cups of peppermint tea, this was no surprise. I had already tasted the lavender eo, and knew better than to ask a 6 year old to try it by itself. I started mixing drops of the lemon and peppermint eo's into about a quart of water. I used a glass pitcher, because citrus essential oils can break down plastics over time and this could cause chemicals to leach into the water. We did two drops of lemon with one drop of peppermint, and he didn't mind it at all. Then two drops of peppermint and two drops of lemon. He didn't notice the extra peppermint. Then, I added one drop of lavender. I had to tell him it was there because one drop of doTerra CPTG lavender oil diluted in a quart of water still gives off a lav fragrance! But he said he didn't care. I tasted it and was shocked by how strong the lavender taste was - not unpleasant, but strong. Then I backed off on the extra drop of peppermint oil and in a few days took away the extra drop of lemon oil. The final product is one drop each of the allergy trio in a quart of water. Is this enough to make a difference? He was coming home with a light cough and clear nasal drainage, and when he drinks his allergy water these symptoms stop. We are trying to trigger the body's natural responses to allergies, not mask symptoms. A little goes a long way, and many consistent eo users claim that they need less oils, used less often over time to get the same result. I'm guessing its similar to homeopathy. He has zero complaints, and just has to remember to shake the bottle as he drinks it. His allergies are staying under control throughout the school day. 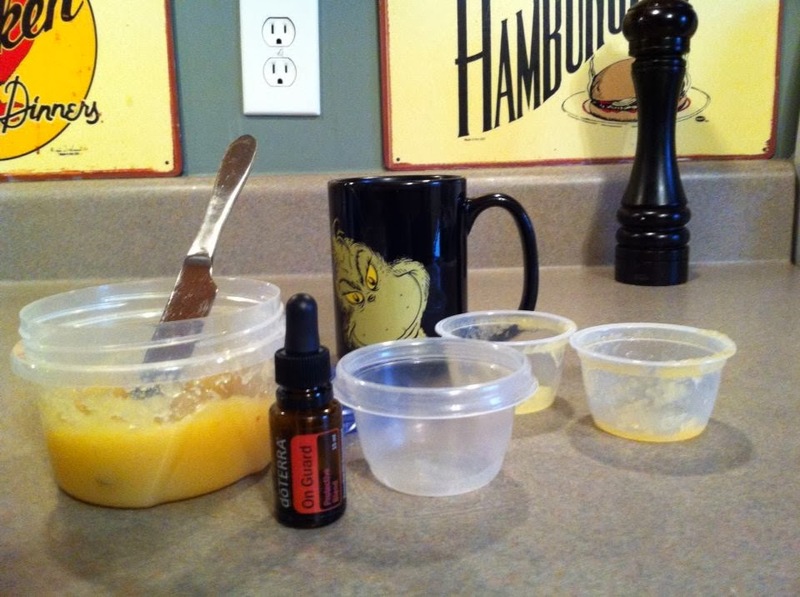 Seasonal allergies wax and wane, the plan is to go up to 2 drops of each eo if his allergies worsen. wholesale $0.20/Preferred Member $0.22/retail $0.26 (yes, that's in cents). We use Bisquick as a base for dairy free pumpkin pancakes. The Ultimate Pancake recipe on the box lends itself well to adding EO's to the pancakes. I'm not going to repeat the full recipe here since it's on the box, and you can link to the recipe as well. Here's how we make fluffy, aromatic, and delish pumpkin pancakes. I cut the recipe in half; it made 16 medium sized pancakes. Disclosure - it actually made 8 because I started to read a book to my kids and forgot I was cooking pancakes. Then I smelled the first round burning. 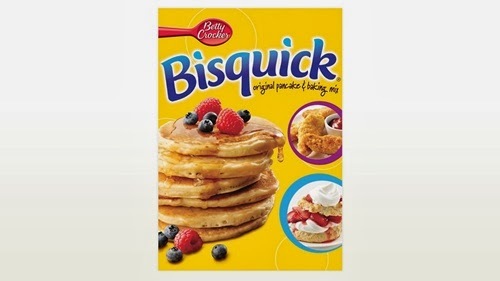 But if you are more focused than me, you will get about 16 pancakes with 1/2 the Bisquick recipe! Add 2 drops of Clove Bud oil and 2 drops of Cinnamon oil to the cooking oil before mixing. This step is important. Combining the EO's and a cooking oil reduces the chances of the heat of cooking breaking down the properties of these two great immune boosters. You can substitute Agave for the sugar in this recipe. Mix, match, and substitute regular spices, Cassia, or On Guard as needed while you build up your Wellness Pantry of essential oils. One trick to fluffy pancakes is not to over stir the mix. This tip can make the cheapest pancake mix yield fluffy pancakes. Mix the dry ingredients in one bowl, mix 1/2 can of pumpkin with the wet ingredients in another. Stir as little as possible when combining. Add more milk, yogurt, or milk substitute (we used almond milk) if the batter is too thick. Take it easy when stirring. A few small lumps will cook out. Chill batter for about 5 minutes before cooking - another trick to getting fluffy, homestyle pancakes out of a mix. I like my pumpkin pancake batter to be thicker than regular pancake batter. It makes them more dense. Make them smaller (like silver dollar size), and the kids can eat them by hand for lunch or snack. Pumpkin pancakes freeze great. We make them for breakfast or dinner, then freeze the leftovers in single servings to send to school during a busy week. This one is easier - the Clove Bud oil and Cinnamon Bark oils in On Guard makes it taste like baking spices. It's yummy in apple juice or cider, sweet potatoes, sandwich spreads, yogurt, caramel dip, anything pumpkin, and banana bread. Care needs to be used when cooking with essential oils since heat can reduce their therapeutic properties (more on this later). But adding it to applesauce is easy and yummy! We dilute it because On Guard is a strong flavor and it can tingle in the mouth and throat. I mix one drop of On Guard Protective Blend into two individual serving containers of applesauce, then repackage for the lunch box. I'm not using jarred applesauce because I got 15 six packs of apple sauce for less than $5 with one of my couponing deals (told you I hate to pay retail!). We've been using On Guard often enough that my son could probably handle one full drop in an individual serving of applesauce. But my daughter has never been a huge fan of these spices, so I'm thrilled that she loves this. Try it, it's really tasty! I'm still in the process of creating the research section of Essential Oil Family blog, but the study I made a point of getting up first is about how On Guard Protective Blend stops an influenza virus from reproducing. A little extra On Guard in the middle of the school day is reassuring! But if you must, you can shop for these and other great doTerra items through my online catalog. Contact me for details on how you can purchase doTerra essential oils, supplements, and accessories at Preferred Member or wholesale prices.